It’s February, and that means the football fandom is having an important episode. As geeks, it’s our duty to support our fellow obsessive fans by tuning in and enjoying the most important part of the event – the geeky commercials. 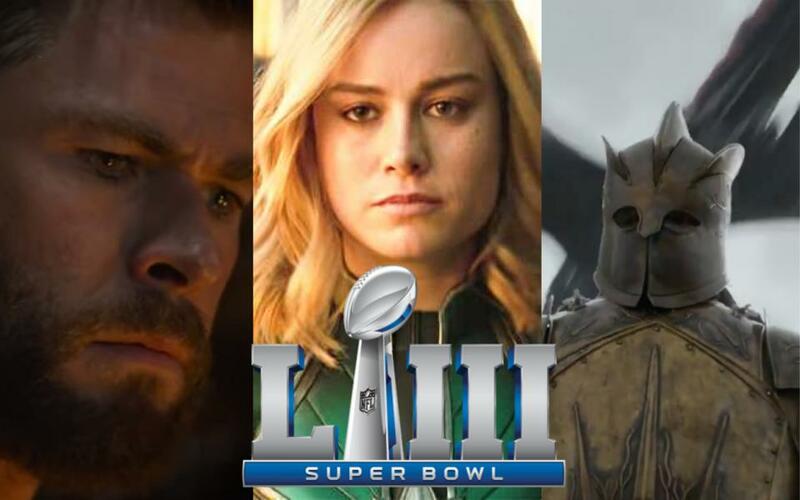 Join us for our Super Bowl LIII trailer round up and let’s break it down! The first geeky Super Bowl LIII trailer was a gut punch. Avengers: Endgame is going to break our hearts and there’s nothing we can do about it. The trailer contains new footage of the remaining Avengers and Guardians of the Galaxy (poor Rocket) as they come together to undo what Thanos did. When I watched Avengers: Infinity War, I was shattered. I was especially broken over Bucky’s death, so all this new footage of Steve mourning him (and, uh, everyone else of course) really got the waterworks going. How are we going to survive this film, guys? HOW?! And, of course, I used this super sad trailer to make a painful prediction and cause my twitter followers to cry. Steve spends all of End Game trying to save everyone, Bucky included. Moments before everyone is saved, Steve dies. Bucky returns and is all alone. The next Super Bowl LIII trailer was for another MCU property, Captain Marvel. Though this film is less secretive when it comes to footage than Avengers: Endgame, it’s just as much of a treat to see more of this highly-anticipated MCU installment. The theme of the trailer is “higher, further, faster,” and focuses primarily on the badass action sequences that we’ll be getting from the film. I understand using a major sporting event to pull people in using action, but I prefer the other Captain Marvel trailer we got, where we get to know the characters a bit better. But hey, I’m not going to complain about new footage. I’ve already got my ticket. I’m sold on this and eager to eat up everything they give us. The third Super Bowl LIII trailer we got during the game was a rather bizarre Game of Thrones/Bud Light ad. I’ve got to be honest here. I didn’t really dig this ad. But hey, maybe I’m not the primary audience for it. I’m kind of a snooty microbrew beer drinker and I’ve been chomping at the bit for more actual GoT footage. So a Bud Light ad with no actual footage was…. not my thing. I’m sure some people out there enjoyed it, though. So here it is in all its weird glory. Next up we have Alita: Battle Angel, which is a property I haven’t been following nearly as closely as the MCU installments or Game of Thrones, but has had quite a bit of buzz in geek circles nonetheless. Check out our interview with VFX supervisor Eric Saindon for more details! The Superbowl LIII trailer is certain to pull in some like me who have been focused on our other major franchises the past few months and have missed some of the buzz. Update: Check out our review of Alita: Battle Angel. I keep hoping that someday the show will have a moment as an outlet for some much needed catharsis about the world, but right now it’s just hit after hit of bad patriarchal terror. I suppose the darker things get, the more cathartic it’ll feel if she ever gains her freedom. But it’s…. a lot. Too much, sometimes. But I’ll keep coming back to watch her fight back over and over again. Unlike the aforementioned Game of Thrones trailer, I feel like I’m definitely the intended audience for this one. Next up in our Superbowl LIII trailer round up is The Twilight Zone, scheduled to air on CBS All Access this summer. We don’t get any actual content from the show in the ad, but Jordan Peele certainly sells it. He managed to have a similar cadence as Rod Sterling while still making it his own. Though I don’t have any idea what stories are heading our way with the series, I’m ready to rally behind Jordan Peele. So I guess in a way this vague ad succeeded. Guillermo Del Toro’s Scary Stories to Tell In The Dark also made a Superbowl LIII trailer appearance with three separate spots. I’m very picky about my horror flicks, but I trust Del Toro so I’m looking forward to how this shapes up. The fact they dropped so many ads for it today is sure to get some attention as well. Usually one Super Bowl ad is a huge enough deal. Three? That’s a lot of cash right there. Next up was Toy Story 4, which released a small sneak peak after the game concluded. So what was your favorite Super Bowl LIII trailer? It felt like a rather weak year considering everything that’s coming in the next few months, but I think Avengers: Endgame won this one fairly easily. It had actual new content and a tone that’s the perfect follow up to how the previous Avengers installment concluded. But there wasn’t much competition this year. I was hoping for, at the very least, a Stranger Things ad. Oh well. Previous:Jussie Smollett Shares Official Statement After Racist & Homophobic Attack!